Fife Flyers forward Bari McKenzie is hoping their two wins over the weekend "sets us up for a strong finish to the regular season". Victories over Dundee Stars and Coventry Blaze gave them a four-point weekend for the first time since the middle of October just as the race for the play-offs gathers pace. Stars' loss in Kirkcaldy means they drop into second-bottom place in the Elite League table. Meanwhile, Glasgow Clan suffered a rare no-point weekend but remain third as their form took a sudden dip. Flyers are now sixth after wins at the expense of two teams around them strengthened their own play-off position ahead of 13 remaining games that will all be played in the next 34 days. "We know what we can do, although we have a tough test when Belfast come on Wednesday," McKenzie said of facing the league leaders. "For the rest of the run-in, there are tough games, so we may as well take the play-off mentality and treat every game as such. "You can't afford to take your foot off the gas and we're in a position where we're constantly battling. We showed great character to get through these two games. "We know we can still be that team that did so well at the start of the season and we got the four points because we came together as a group and battled." Flyers went ahead in both games, their opponents pulled level, only for Fife to edge on and take the points. Dundee, in their only game of the weekend, went to Kirkcaldy after beating Flyers last week and Todd Dutiaume's side dished out their revenge in a 4-3 success. Two from Evan Bloodoff and a shorthanded Carlo Finucci finish put Fife three up and it looked good - at least for a few minutes - until Omar Pacha pulled one back for Dundee. It sparked the visitors into life and Lukas Lundvald Neilsen and Fabrizio Ricci netted to pull Stars level, but Rick Pinkston's winner with seven minutes to go clinched it for Flyers. On Sunday, Brett Bulmer and Finucci had the Kirkcaldy side two up at the Skydome, but Coventry hit back through Thom Flodqvist and Dillon Lawence, only for Bloodoff to seal the 3-2 result in the end. Clan returned to Scotland with nothing to show for their efforts away to Nottingham Panthers on Wednesday and Guildford Flames on Sunday. Panthers were two up before the Clan started to hit back through Gerard Hanson, Brendan Connolly and Tyson Wilson to put the visitors ahead. But four goals in the third period allowed Nottingham to come back and take the victory to leave Glasgow beaten. Pete Russell's side found themselves three down without reply against the league's form side in Guildford. Two from Scott Tanski got them to within one, but a later empty-net goal secured victory for Guildford. 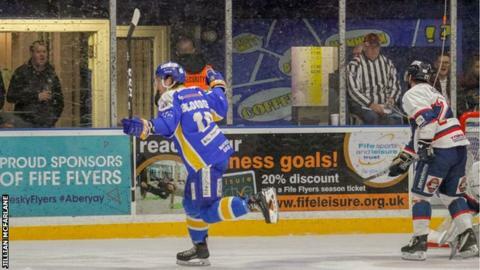 Fife Flyers' victory away to Coventry Blaze on Sunday was their first success on the road in five games. Dundee Stars' Omar Pacha's goal against Fife Flyers on Saturday was his eighth since joining them in July 2017. His last six have all been against Scottish opposition. Glasgow Clan picked up no points in a Saturday-Sunday weekend for the first time since they lost to Coventry Blaze and Cardiff Devils at the end of September. Those games were also on the road.